On Carrer Montcada, a street known for its elegant medieval structures, five palaces or town houses, dating from the 13th to 15th centuries, have been converted into the Picasso Museum, home to one of the most complete collections of works from his youth and formative years as an artist. Pablo Picasso spent his early years in Barcelona (between 1901 and 1906), and the museum is now one of the city's top attractions. 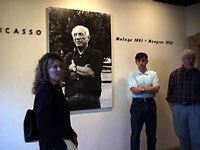 It was Picasso's wish that his youthful work would be displayed in Barcelona and the core of the collection was donated by the artist himself. The permanent collection now consists of 4,249 works and the art is complemented interestingly by the old buildings, which showcase the Catalan Gothic style. The collection includes a number of childhood portraits and paintings, as well as engravings, drawings and art from his Blue and Rose Periods. It is important for visitors to understand that this museum does not house Picasso's most famous and recognisable pieces, but is dedicated instead to an exploration of the artist's formative years and development. Audio guides are available. The queues can get really long at the museum and it is best to arrive early or book in advance online. Opening times: Open Tuesday to Sunday from 10am to 8pm. Admission: €11 (adults). Concessions available.